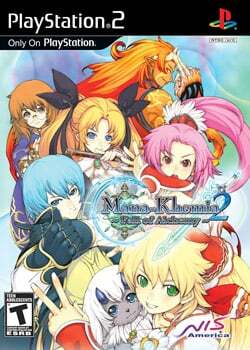 Game description: Mana Khemia 2 adopts a unique type of turn based battle system. You will have a set of attackers and supporters that switch in and out throughout the battle with attack/support actions. Over 100 items to craft. Players can search for ingredients throughout the world and create new items using what you've found. There are 2 separate stories ready for Mana Khemia 2. Depending on how you played the game can alter the ending, so there are 2 storylines for the 2 main characters. Head back to Al-Revis Academy for another year of academic advetures. This time you get to choose between two main characters, each with their own group of workshopmates. Study hard in the courses of Alchemy or Combat, or you might not survive till graduation. Mana Khemia 2: Fall of Alchemy is the sequel to Mana Khemia: Alchemists of Al-Revis. Description: Shows white or black outlines on the character portraits.